For Ian Boddy, performing music before an audience is both a personal and collective experience. The spacemusic aesthetic calls for him to travel inward to the point of near complete engrossment yet still be able to shape the energy and contour of the music into a coherent and interesting composition. A veteran of the international EM scene, Boddy has given numerous concerts and uses this venue as more than a means to promote his recorded works. For him it is a communion between technology, the public, his own genius and occasionally a collaborator. 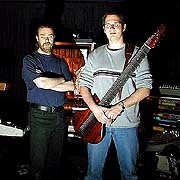 In the case of Live at Jodrell Bank Planetarium, synthesist Boddy is joined by "touch" guitar player Markus Reuter. This release contains music recorded live in April of 1999 at one in a continuing series of concerts held within the planetarium located on the site of England's Jodrell Bank radio telescope. This pristine recording contains two near 30 minute tracks, "Binary Part One" and "Binary Part Two" plus "NoSpace", their improvised encore. The album opens with a text-to-speech type computer voice oratory. Once past this introduction, the duo explore the lower levels of tonality with Boddy's compelling synth pads and Reuter's volume pedal swells. Out of this comes a rhythmic element. Each layer is born, breathes and is then joined by a counterpart or accent until the relentless march is tamed by Reuter's snake-like lead lines. As the melodies soar above, Boddy is tweaking the beats, adding and subtracting, opening and closing, until the piece backs down again into the warm darkness. The second track begins as if drifting among stars. As the mood grows more intense, a deep pulsing bass pattern surfaces. Exactly in sync, the truncated steam vent hissing of analogue percussion modules chirp, echo and snap. Here Boddy really jacks it up a notch as a grainy full-on drum 'n bass loop drops in. Over this, Reuter takes his instrument into melodic territories akin to rock-fusion. The piece runs its course and, one by one, the rhythmic parts fade down into a gentle harmonic resolution. 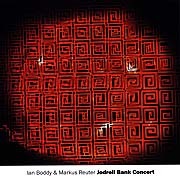 An intelligent combination of improvisation, musicianship, spontaneity and the wonderful transformational properties of spacemusic, Live at Jodrell Bank Planetarium is a sincere and powerful album espousing that which is "great and deep" in sound, space and within ourselves.